If Ian Kirk is having a tough time adapting to his relatively new job as the group chief executive of Sanlam, he knows how to hide it. 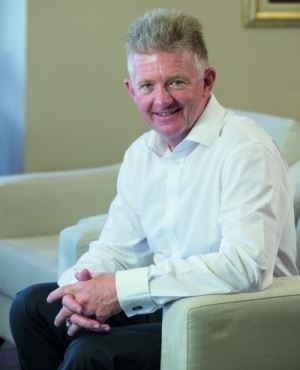 Ian Kirk, the group chief executive of Sanlam. Taking over from Johan van Zyl was never going to be easy. Van Zyl, an academic-turned-business superstar who ran the group from 2003 to 2015, transformed it from a South Africa-focused company where 85% of business came from the Afrikaans community into a pan-African business with operations in India and Malaysia. Yet Kirk’s timing could hardly be worse, taking the hot seat as SA’s economy comes grinding to a halt and the world seems to move into bear market territory. 2015 was a tough year, as the group’s recently released results show. While diluted headline earnings per share were up a respectable 12% to 459.5c, Sanlam’s shareholders have been getting used to more, and the share price dropped 5.8% following the announcement on 10 March. It’s often in tough times that organisations can get ahead of the competition, Kirk says. Another benefit of the tough economic climate in Africa is that international competitors, who have been very active in East Africa in particular, “tend to back off a bit”, Kirk says. The other thing that people often get wrong is that economic conditions don’t affect Sanlam’s operations that much in every market in which it operates on the continent, he says. “In the countries where our market position is big and insurance penetration is high, there we are impacted, like South Africa (which accounted for 67% of net operating profit in 2015), Botswana (5%) and Namibia (5%). In other countries, where insurance penetration is very low, we can still keep busy in difficult economic times. By building a brownfield business that didn’t require much capital, Sanlam is also better positioned than many other South African businesses operating in Nigeria. It has no need to import goods, such as Shoprite or Truworths – which recently announced its withdrawal from the country – or have to struggle to repatriate dividends, given the country’s current foreign exchange controls. Despite the current economic challenges, Sanlam believes the continent’s growth story “remains intact”. The group has just finalised its acquisition of a 30% stake for $375m in Morocco-headquartered Saham Finances, which sells insurance across 26 countries in north, east and west Africa. Saham Finances recorded a turnover of more than $1bn in 2014. “They’ve really assisted us in putting an unrivalled footprint on the ground,” Kirk says. The deal came about after a two-year engagement with the Saham team. It’s premature to speculate on whether Sanlam would want to further increase its stake in Saham in future, Kirk says. But what is certain is that the group has a R2.3bn war chest available for “strategic initiatives”, and that this cash pile can be leveraged for even larger transactions, should the opportunity arise. For now, the focus is on building its business in Africa, Kirk says. “We’re going to turn up the dial on Africa, and maybe turn down the dial a bit elsewhere for a period of time. We see an opportunity to build a footprint for corporate and retail business that’s pretty much unrivalled on the African continent." With a number of regulatory changes, such as the Retail Distribution Review, which will change the way customers can get face-to-face financial advice, and the impact of the internet on traditional business models, there is a constant need for Sanlam to adapt its business models. “The whole point for us is: are we going to adapt, and are we going to be there for the client at their time of need? And we’ve done it before. You used to only be able to get a Sanlam or Santam policy through an intermediary. Now you can get it from a broader distribution footprint. There are clear plans on how to fix the economy, such as the National Development Plan (NDP). The challenge is implementation, he says. Irrespective of the downgrade, it is time that we fix the things that need to be fixed, Kirk believes.